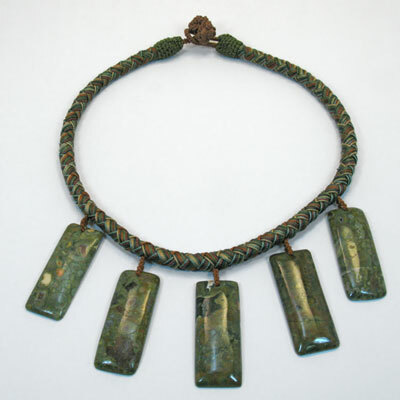 This is an earlier version with knotted Chinese buttons for the clasps. I strated making thes clasp for customers with metal allergy. For them a pice completely with nylon thread is ideal, as nylon does not create any sensitivity. The rainntree jasper is from the ryolite family. The rectangle hhave a flat back so they lay well in the chest. The colors are soft fall greens with rust and tan. Red Coral Nuggets. Black onyx rings and toggles. Nylon cord.